Susan Blandford, founder and executive director of St. Louis Teachers’ Recycle Center, works an abacus in the Play Your Art Out Studio at STL Venture Works, 31 Lemay Ferry Road. photo by Diana Linsley. Coloring outside of educational lines by playing around dumpsters has become normal for Susan Blandford. 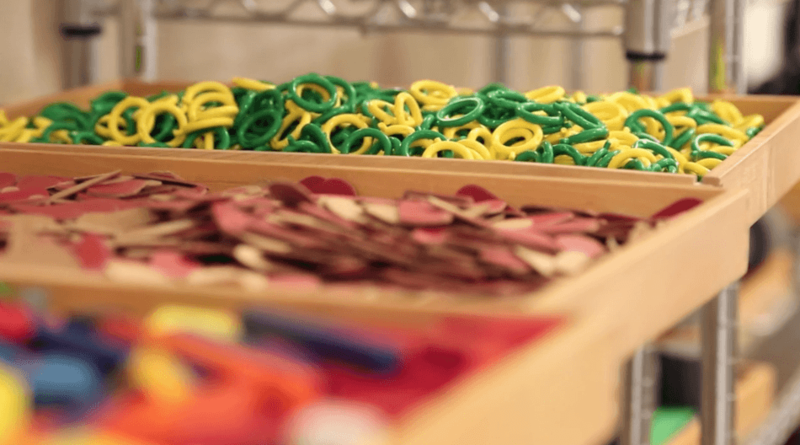 As executive director and founder of St. Louis Teachers’ Recycle Center Inc., Blandford relishes keeping reusable products out of landfills and in the hands of local children who desperately need classroom items. In fact, Blandford’s spontaneous efforts 25 years ago have led to 10,000 pounds of donated materials every three to six months being used by 1,110-plus teachers, artists and individuals in the St. Louis area. St. Louis Teachers’ Recycle Center, founded in 1992, now has two locations open to the public: 315 Lemay Ferry Road inside of STL Venture Works and at Chesterfield Mall. These centers have lasting impacts on volumes of people through art and play studios; classroom materials; workshops for children and adults; and special events. Up until this year, Blandford has gotten by on donations and grants from entities such as the St. Louis-Jefferson Solid Waste Management District. But, after 25 years of use, the floorboard of the center’s delivery van is rusting and falling out. So, a first-time fundraiser is planned for Feb. 10 via a Trivia Night at the Pavilion at Lemay inside of Jefferson Barracks Park. Trivia night sponsorships are available. A table of eight costs $200. Proceeds go toward purchasing a new mini-van. Estimates are that each teacher tapping into the center’s resources could be serving 300 children. Stacey Georges, who does community outreach for St. Louis Teachers’ Recycle Center, made this butterfly out of donated materials in the center’s Play for Peace room. photo by Diana Linsley. Samples of center-provided educational materials for a $1 per pound service fee include buttons, coins, sea shells, books, yarn, keys, office supplies, corks, vintage jewelry and paints. Blandford was an early childhood teacher two-and-a-half decades ago in Webster Groves at Eden Laboratory School (now operating as The Lab School in Kirkwood). She admitted that establishing a recycle resources center wasn’t her mission when she flew to Boston to study with educators from Italy about the Reggio Emilia constructivist approach and educational philosophy. “The class ended up being extremely inspiring,” remembered Blandford. The class spotlighted the number of products being eliminated by Boston, a port city and home to a large number of manufacturers. But it was the playing with reusable materials and journaling portions of the class that nabbed Blandford’s heart, she said. From left: Susan Blandford, executive director/founder of St. Louis Teachers’ Center; Margie Hoeing, center director; and Stacey Georges, community outreach, stand amid some of the donated items. photo by Diana Linsley. Blandford said she and 20 teachers were encouraged to write down their thoughts after they creatively “played” with resources. “A teacher from Vietnam built furniture with her recycled materials, and shared how she and her family grabbed furniture pieces when bombs went off during the Vietnam War,” Blandford said. “It was emotional. “For my own story, it was about building things for, and missing, my family. At that point, I thought, ‘wow, this approach to hands-on exploration is powerful,” Blandford explained. When the preschool teacher returned home, she couldn’t help but see opportunities for the same kind of reusable education efforts. The Boston group sent her a starter play kit. She went through more training. Soon after, her initial gathering of materials took over her personal garage, and eventually got moved into a Junior Achievement cement block building during her “test summer” with teachers. Blandford chuckled about how time has flown since the center’s launch in 1992. 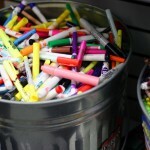 Art supplies in the Play for Peace room. photo by Diana Linsley. The recycling centers are virtual wonderlands for creative minds. Everything available is donated by the public or by local industries, often due to word-of-mouth referrals. Blandford and her volunteers have been a part of several communities. In 2007, the center was located inside Crestwood Mall. “We’ve actually moved 17 times in 25 years,” said Blandford. She announced she’s now seeking a new location in Lemay or Affton. The center’s offerings are perceived as extremely valuable to some, such as the teacher from Alaska who flew in to get materials. Another happy, repeat customer is Marion Endress, a Lemay resident who founded the nonprofit Paws On Wellness. It provides educational and therapeutic support by connecting pet therapy teams to people who experience emotional and traumatic challenges. She, too, operates on a frugal budget, and secures items from the center to use with elementary and middle school students. Examples of area businesses and entities that bolster the center are the Gifted Resource Council in Webster Groves; Laurie’s Shoes in Glendale; Webster University; PNC Bank; The Magic House in Kirkwood; and Feed My People in Lemay. The 67-year-old Blandford is starting to think about rechanneling her passion in less-time intensive ways. She recently hired Stacey Georges as a community outreach manager to work alongside Margie Hoeing, who directs the South Center. But no matter how Blandford attempts to streamline her efforts as she reaches retirement, she won’t be able to pass by an industrial court without wondering what gems are inside the buildings, just waiting to be lovingly reused. To donate materials, or to volunteer, email the center at sltrc@sbcglobal.net or phone 636-227-7095. South County Teacher’s Recycle Center hours are Mondays and Wednesdays from 3 to 7 p.m., plus every third Saturday from 10 a.m. to 4 p.m. Details about the Trivia Night can be viewed at sltrc.com/trivia.